for YOUR car. or any car. on the road and off the beaten track. Built around the Raspberry Pi Model 3 the Nomadic Pi is an Open Source car computer. The Nomadic Pi can be built with "off the shelf" consumer grade hardware and is easily extendable to match the exact needs of the user. Dreamt up during the planning stage of a trip around Australia. A long trip was going to need a lot of music. A single lap of Australia's Highway One is 14,500km and that excludes the state of Tasmania and any deviations to see fun stuff along the way. Live GPS speed information was required to minimise speeding tickets for the local constabulary. Along with a WIFI hotspot to provide internet connectivity to the other devices in the car. A simple area to store important documents like the field service manual for the car in case of mechanical issues on the road. Then some nice to have features like mapping the car's location and local weather information. So with a comprehensive feature spec decided on. There was just the small job of writing the code and assembling the hardware left. It could be claimed that part of the job is not still 100% just yet and development of the Nomadic Pi is still ongoing. But after 20,000km of usage on and off road, 3 oil changes and four Australian states. It was clear that the codebase was stable enough for a public version 1 release. You can download a prebuilt image for use with your Raspberry Pi 3 here. Or learn more about the hardware required to build your very own car computer. The Nomadic Pi is a project under constant development so new features are being added all the time. 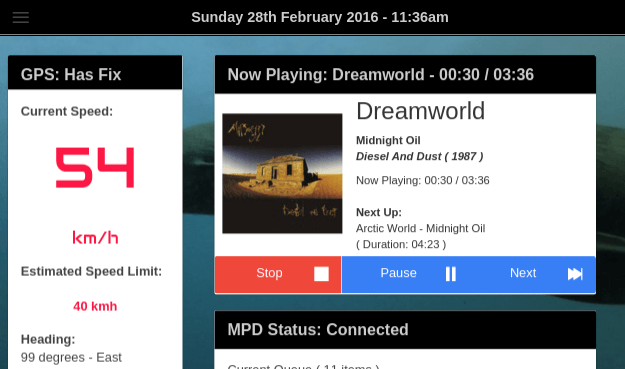 Listen to your favourite tunes with the MPD service. The code that runs the system is freely available on github. Feel free to modify and extend as you see fit! Access the Internet on your other devices in the car through the Nomadic Pi WIFI hotspot. Speedometer out due to running oversize tyres on your car? Avoid expensive fines with a real time GPS backed speed read out. The Nomadic Pi is put together to "work out of the box" with a standard hardware configuration. This doesn't mean you need to use the standard hardware though! As a rule if it plugs into a USB port and works with Linux you can use it! Raspbian OS, GPSD, MPD, Ionic Framework. Combined with 20,000km and counting of on and off road testing. If a custom car computer for your car has you excited. Check out the following pages to see what is involved in building one of your very own. Already know where your headed? Feel free to download the image and start building your Nomadic Pi. The bits you need to know before getting started. Or possibly afterwards if you are lost and need some direction. Some Assembly Required! Go grab your screwdrivers and soldering iron, lets get this car computer built. TIME TO HIT THE ROAD ? Download the image file, write it to an SD card and get started building the perfect entertainment system for your vehicle.